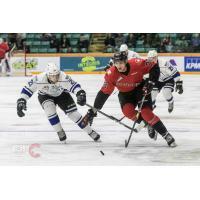 PRINCE GEORGE, BC- The Prince George Cougars winless streak stretched to 14-games after a 4-1 setback to the Victoria Royals on Friday night at the CN Centre. Cougars' captain Josh Curtis scored the team's only goal, six-minutes into the second period, as the Cougars had trouble with Royals goaltender Griffen Outhouse, who was named first star after making 32 saves. Cougars' Taylor Gauthier was tagged with the loss, yielding four goals on 21 shots. Tanner Sidaway had a pair of goals for the Royals, including a short-handed marker, and Kaid Oliver and Logan Doust chipped in with goals as well. General Manager & Interim Head Coach Mark Lamb says his team is battling against frustration, "The effort was there, no doubt about that, as we threw a lot of pucks at the net but it's the critical mistakes that is costing us." "We don't have patience in important times of the game to just stick with it and play the right way. There's a lot of try, there's a lot of care and a lot of frustration. Frustration is hurting us, and we have to find a way to play through it." The Royals opened the scoring, nearly four-minutes into the first, as Tanner Sidaway had his shot go off a defenceman's stick before catching the far-post and beating Gauthier. Sidaway doubled the Royals lead, whilst short-handed, scoring off the opening face-off in the second period. Sidaway grabbed the puck in the neutral zone and moved in down the left-wing and scored from the face-off circle. The Cougars got a goal back six-minutes into the stanza, as Josh Curtis beat Griffen Outhouse upstairs after being sprung on a breakaway. The visitors got that goal back and one a strange bounce. Victoria went up 3-1 late in the second, when Phillip Schultz had his shot from the slot go off teammate Kaid Oliver and flutter in over the Cougars' netminder. The Royals had more puck luck in the third period too. Logan Doust capped off the scoring, capitalizing off a turnover right in front of the Cougars' net. The puck jetted off a skate and right to Doust who wired the puck past Gauthier nearly seven-minutes in. "We just have to make small improvements, game by game and the next game we win is going to be the toughest game we've ever played," said Lamb. "That's how hard it is to get out of a streak like this. We got to regroup and learn from these tough lessons." UP NEXT: The Cougars (16-33-4-2) face the Royals again tomorrow, February 16th, at the CN Centre; the puck drops at 7 pm. Fans can get their tickets at the TicketsNorth by Treasure Cove Casino box office, or online at www.ticketsnorth.ca.